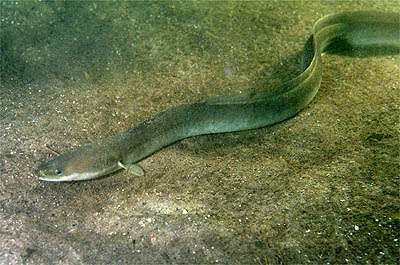 A team of researchers at Universidade de Lisboa has found evidence that suggests global warming is playing a role in the sharp decline of the European eel (Anguilla anguilla)—known more commonly as the glass eel. In their paper published in the journal Biology Letters, the group describes subjecting specimens in their lab to global warming conditions and what they found. Glass eels, so named because of their nearly transparent bodies, are also known for their incredibly long migrations. They hatch in the Atlantic Ocean as larvae and drift along on ocean currents toward Europe and then North Africa. Eventually, they wind up in continental waters, where they grow to adulthood—they then swim back to their birthplace to spawn. They have been declining in numbers for several decades. Several factors have led to the decline, such as overfishing and the blocking of rivers and barriers to migration routes. Recent estimates suggest the population of the glass eel has dropped by over 90 percent since the 1980s. In this new effort, the researchers suggest climate warming could drive the glass eel to extinction. To better understand what might be happening to the eel, the researchers captured several specimens and subjected them to conditions caused by global warming and CO2 emissions—warmer and more acidic water. To gain a clear understanding of the impact of both, the researchers placed some of the specimens in warmed water, others in more acidic water and others yet in tanks with water that was both warmer and more acidic than the norm. The researchers found that warmer water led to a lower survival rate for young eels—though those that did survive showed more active temperaments, which might confer a better chance for surviving their long, 4000-mile migration. But higher acidity in the water made the eels less enthusiastic about migrating. This second finding backed up prior research showing that acidic water causes sensory damage to the eels. The researchers suggest that fully understanding the conditions in which the eels live is critical if there is any hope of mounting conservation efforts to prevent their extinction. yes. glass eels have never survived massive climate change. and won't the piddly change over the past 150 years. yes i said it. piddly.